To say Nashville is changing would be an understatement. Vertical, residential developments are becoming the new norm as more and more people want to live in downtown, urban environments. 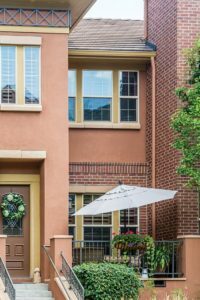 The shift has inspired us to focus on outdoor living for everyone, not just homeowners with under utilized screened porches. Here are our top 3 tips for outdoor living, urban dweller edition! As we see more and more Nashville high rise buildings go up, we think it’s high time we paid attention to vertical living and the implications it has on urban living. If you are lucky enough to live in one of the tall buildings in town, consider your patio and/or terrace. Bringing life to that space will not only improve the overall look of the space, it will give you added square footage. 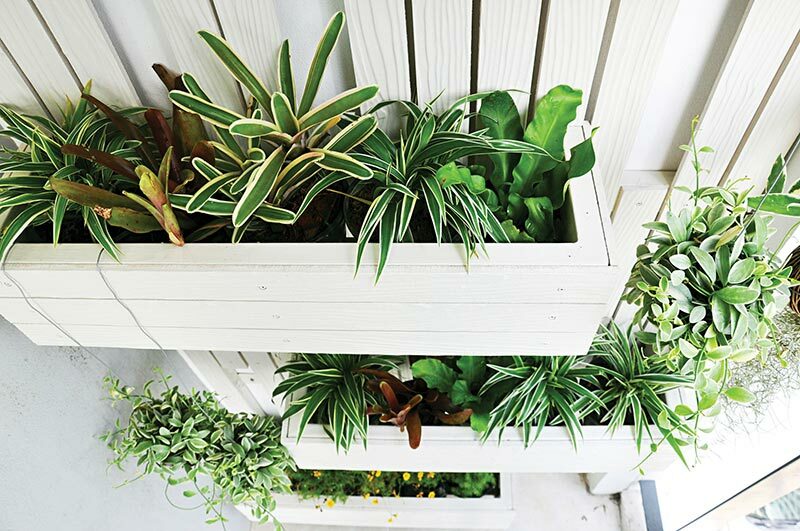 Consider vertical plants for privacy, leafy trees for volume, and layer in potted flowers for a splashes of color. Options might include a vertical wall of plants, hanging baskets, or ladders or latticework leading from pots to allow a space for climbing plants to grow. In addition, you can add a few small eclectic items, perhaps echoing the pop or color to spread the cheerful look. 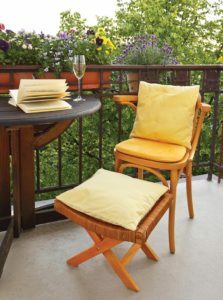 Add colorful outdoor cushions, an umbrella, or other outdoor objects that may fit in the space and continue the color theme. Always remember to check with any homeowners association or building manager to make sure your plans are acceptable before you invest money. Add a geometric outdoor area rug to help define the space and some type of dimmable lighting to help create a nice night time ambiance. We suggest lanterns that can be plugged into outdoor switches or hanging rattan fixtures to add texture. The heat island effect isn’t just for big cities. Did you know nighttime temperatures in cities can be 22 degrees warmer than surrounding areas? Whether you live in the city or on the outskirts, what you do with your roof can have an impact on the environment as well as the value of your home. If you have access to a flat roof in your home or in your building, talk to a professional about creating a living roof and/or outdoor living area. As we continue to see Nashville grow and build up, we will see more and more luxury real estate develop these kinds of spaces. If you are lucky enough to live in a single family house close to downtown—or even on the outskirts of town—and have a slanted roof, consider creating a cool roof (a roof that reflects more sunlight than it absorbs). It will help lower your energy bill and work towards reducing the heat island effect in Nashville. Cool roofs range from reflective white paint to reflective shingles or tile. There are many options that are more environmentally friendly than traditional roofing materials!